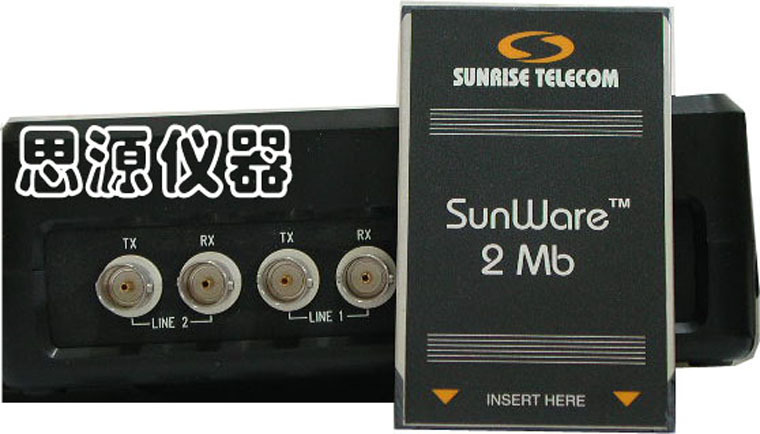 The SunSet E10 is a handheld multifunction tester for transmission testing at 2.048 Mbps, channel testing, datacom testing and switching analysis for MFCR2, CCS7, GSM and ISDN PRI. With it's unique "THRU MODE" and in-service dialing and testing with dual transmitters and receivers, it has revolutionized field testing of telecommunication circuits. Bit Error Rate with G.821, G.826 and M2100 measurements for nx64 kbps and 2.048 Mbps circuits. Also measures clock frequency, true instantaneous and cumulative clock slip and wander, as well as signal level and alarms simultaneously in two links . Displays received signal pulse shape graphically, superimposed with ITU-T G.703 mask. Measures BERT on leased datacom lines with G.703 co-dir, V.35, RS-232 etc. from 50 bps to 2.048 Mbps. Measures VF level and frequency, Signal to Noise Ratio and Psophometric noise on any selected channel. Injects tone with variable level and frequency. Also allows a user to talk into any channel and listen to conversation bi-directionally while in-service. Bi-directional MFR2C analysis and dialing with timed CAS (ABCD) bits transition and tonal event capture. Detailed CCS7 protocol decode of CCS7 (ISUP, TUP, SCCP etc. ), GSM (A, Abis.. at 16/64 Kbps). 75ohm. Conforms to ITU-T G.703.